With Jasmine locked away safely, Monica may be able to concentrate on the pursuit and capture of King Kochese. If there was one thing that the DEA and FBI had taught Agent Monica Deitrich , it was to check everyone and trust no one. Between Millicent and Noisy Boy they keep her busy and content, that is, until a new love interest threatens to tear down everything that she’s built. A series of gruesome murders are happening simultaneously, spanning from the east coast to the Midwest and they have Jasmine and King’s signature style written all over them. Monica can feel it in her gut that King is behind the murders, but Jasmine is tucked away in a government asylum awaiting trial. The body count is rising and all roads lead to King Kochese, but how can Monica track a ghost? How can she corner a ghost with unlimited resources and connections, capable of ruining not only her career, but her life with a snap of his cold blooded and calloused fingers! 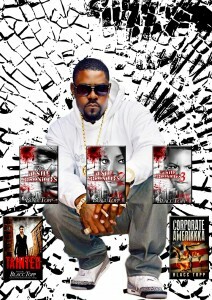 Tainted No More is the third installment of Novelist Blacc Topp’s Tainted series. If you love horror, thrillers and suspense, with creative plot twists, then this series is definitely for you. I have read all of Novelist Blacc Topp’s books and he doesn’t disappoint. He is a talented writer who knows how to weave a story and take you on a rollercoaster ride in your imagination. What I took away from this book, or the central theme for me was the affects of childhood abuse and how it manifests or plays out if it’s left untreated. I must confess that I don’t typically read this genre. The only reason why I read the Tainted series is because I love Novelist Blacc Topp’s writing style. I happen to like how he develops his stories and characters. He always keeps you guessing, leaves you in suspense and/or surprises you. I rated Tainted No More five stars for the uniqueness of the story, his writing style, pacing and character development. Novelist Blacc Topp was born to a father that was a gangster turned preacher and a mother that was a singer, artist, and scholar. He was born into a family of preachers, pimps, prostitutes, drug dealers, dope fiends, and squares. Blacc Topp was raised on the streets of South Dallas, Texas. After the death of his father, feeling as though he had nowhere to turn he turned to the gang. The neighborhood gang, Dixon Circle 357um Gangsta Crips is where he would learn to become ruthless and unfeeling. Although he was deep in the gang and game, he continued his studies for fear that his mother would make him move to Florida. You can follow him at: Facebook, Twitter and Instagram.